Bartenders make cocktails look so easy. Just shake together whiskey, lemon and honeysuckle-peppercorn syrup, and you’ve got a gorgeous drink! Three ingredients! It takes 45 seconds! If you happen to have honeysuckle-peppercorn syrup sitting around. Today’s bars expend a great deal of effort creating their specialty syrups. So why can’t you buy them and re-create craft cocktails at home? 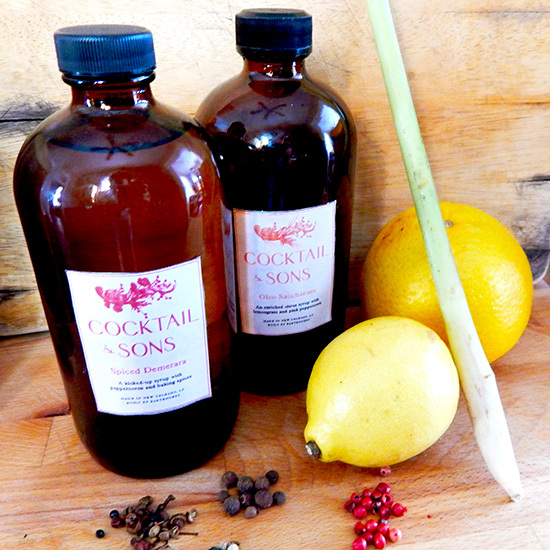 That’s the idea behind Cocktail & Sons, now raising funds via Kickstarter for a line of professionally developed, bar-quality cocktail syrups. Though bars might have a dozen custom syrups, Messier whittled his selections down to four, chosen to work equally well in classic and more inventive drinks. They’re designed for ease of use and practicality, he says. The spiced demerara syrup, made from raw demerara sugar “makes a striking old-fashioned or Sazerac,” Messier says. “The honeysuckle and peppercorn syrup makes a whiz-bang margarita and a beautiful whiskey sour. The mint and lemon verbena is perfect for daiquiris and mojitos with your favorite rum.” The strangest-sounding—Oleo Saccharum—is an old-school bar favorite, a method of combining orange and citrus oils with sugar, historically used as a punch base. According to Messier, it’s a star in any Tom Collins variation when paired with gin or vodka. Check out videos of Messier working with the Cocktail & Sons line—or kick in some cash on the Kickstarter—right this way.